An outrageous spoof of 1950's TV specials - Bing Crosby, Ethel Merman, Liberace (and more!) 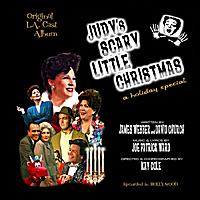 are all on hand for Judy Garland's biggest - and spookiest - comeback ever! Starring Ovation Award Winner Connie Champagne. 11. Ever Been in Love? Saw this show in L.A. about 10 years ago. It was fabulous. You must go to see if it is being produced in your area. the whole family will love it. Guilty pleasure? Sure, but a well-crafted one by songwriter Joe Patrick Ward who knows his musical ghosts of Christmas Pastiche. Song standouts are the deliciously rich-with-cliches "Back in Christmas Town" and the very Judyesque "Angel Star." The included dialogue by James Webber and David Church is equally on target. Ward's music and lyrics show he has done his homework. Musical quotes from the trademark songs abound, and his own orchestrations are further evidence of that and wit. I'd be on Santa's naughty list if I gave away the punch lines and inside jokes, but I think if you love or hate the original articles, you'll have a good time. This is camp, but camp with brains.